This past Sunday, Phil introduced us to the writings of Walter Wangerin. As we continued our study through Luke, Phil chose stories that retold the events of Luke 1:26-45, often called The Annunciation. 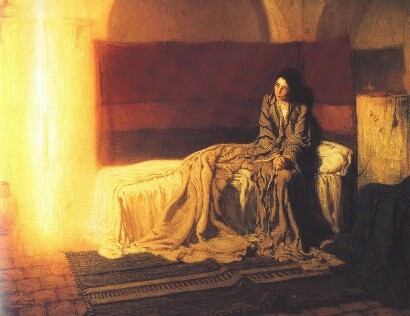 The angel Gabriel announces to Mary that she will be the mother of the Christ child. Wangerin encourages us through his writings to inhabit the story in a new way. We had a good sermon discussion afterwards, as we wrestled with what the birth of Jesus means for humanity. God became flesh. It is an astounding thought. Why would God do this? As you hear Wangerin’s perspective, you’ll be challenged to think about the Christmas story very differently. But I hope you’ll see that as a good thing! We need to have our perspective challenged from time to time.